Any suite that we have created is available as a semi custom. These are a few of our favorites. Each is available in a number of paper, ink and printing styles. Each suite includes the invitation, RSVP, and corresponding blank envelopes in the color of your choosing. The suites are printed on 110 lb cardstock by default. You can also choose from cotton or handmade paper at an additional cost. Customizable items include: ink color for text, envelope color, wording, type of paper and printing style. Colored designs such as flowers or leaves are not customizable for the semi-custom pricing. For extras such as calligraphed envelopes, wax seals, envelope liners, ribbon, menus, place cards, printed addresses, assembly, etc., please request a quote or see our a la carte menu to get an idea on pricing. Prices will vary. Scroll down for pictures and details of our most popular semi-custom suites. The Emmaline features hand drawn line florals and calligraphed details. This suite is available in just about any color you can think of! The Emmaline starts at $250 for 100 invitation sets including the invitation and rsvp card, as well as blank envelopes for both. The Bryn features moody burgundy and red florals, customized calligraphed names and envelope color of your choosing. The Bryn style starts at $225 for 100 invitation sets including the invitation, rsvp and blank envelopes for the invitation and rsvp. The Allie features soft cornflower blue and blush pink hand painted florals. This suite comes with matching envelope liners to round out the suite. The Allie starts at $225 for 100 sets of invitations including the invitation, rsvp card, as well as a blank lined envelope for the invitation and a blank unlined envelope for the rsvp. The Jasmine features watercolor tropical leaves and gold text. This suite, looks especially beautiful with gold foiled text snd deep green envelopes. Text color, border color and envelope color are fully customizable to match your event. The Jasmine starts at $225 for 100 invitation sets including the invitation, rsvp card, and blank envelopes for both. The Blair is a stunning statement suite perfect for Spring, Summer and even Autumn weddings! This suite is full of effervescent yellow florals with small hints of pink, as well as hand calligraphed details. The color of the berries is editable at no extra cost for this suite. The Save the Date format pictured above is the invitation format offered for this suite. The Blair starts at $225 for 100 sets of invitations including the invitation, rsvp and blank envelopes for both.. Please request a quote to receive pricing for this suite as pictured, with a vellum and twine wrap, finished with a wax seal and the addition of vintage stamps. The Anne features sweet soft pink and green florals and the most darling heart shaped wreath. 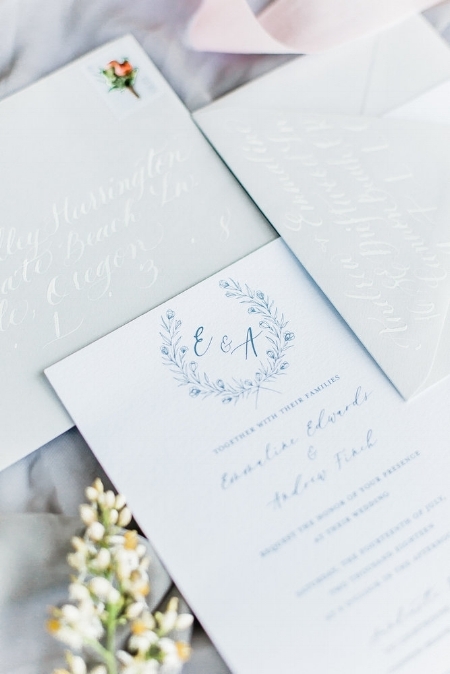 Hand calligraphed names and envelope color of your choice round this beauty out. The Anne style starts at $225 for 100 invitation sets including the invitation, rsvp card and blank envelopes for both.. The Olivia features customized calligraphed names and hand gilded foiled edges in your choice of gold, silver or copper as well as the envelope color and text color of your choosing. The Olivia style starts at $300 for 100 invitation sets including the hand gilded invitation and reply card as well as blank envelopes for both. The Laurel is a favorite with its highly customizable features. 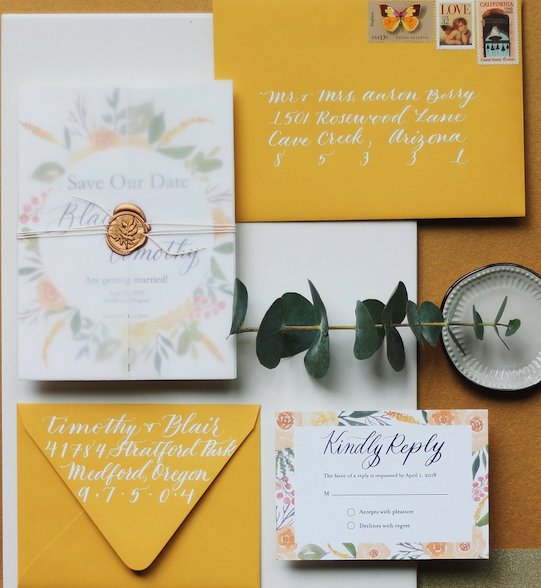 From the text color and wording, to the envelope color, this minimal customizable style suite is perfect for any occasion! Even the hand painted metallic edges can be customized to just about any color you'd like. 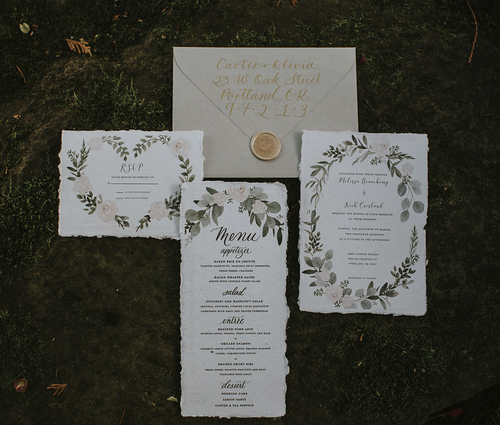 This style feaures custom calligraphed names and venue location. The Laurel starts at $300 for 100 invitation sets including the hand gilded invitation and rsvp, as well as blank envelopes for both. The Serena features hand painted watercolor florals and calligraphed details. The prominent colors of this suite are blush, mauve, soft plum and shades of green. 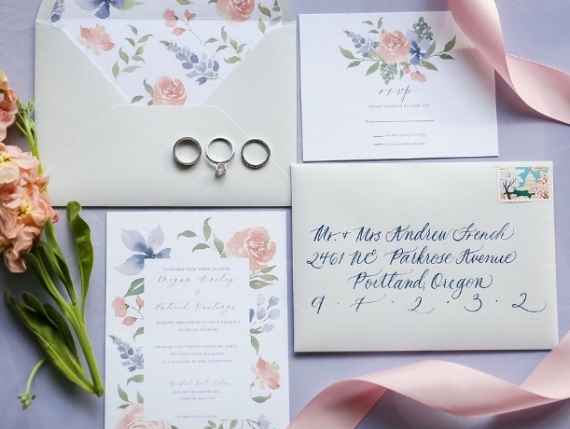 The Serena starts at $250 for 100 invitation sets including the invitation and rsvp card, as well as blank envelopes for both.